The awareness of palm oil is suddenly more prevalent than ever! Infinity foods Shop has been well aware of the sustainability and environmental problems caused by palm oil production as far back as 2013! We carried out a full audit in 2015 on the Body Care and Household products which then spread to the whole shop, we now only sell products with the RSPO (Roundtable on Sustainable Palm Oil) certification and a growing range of palm oil free products throughout the shop! Our body care team began to audit all of the brands and products we sell, asking for the traceability of the fats and derivatives used by them. Products like shampoo, soap and laundry detergent won’t ever say palm oil on the ingredients list, words like glycerine are used instead, but we need to know what this really means as consumers so we can make the best choices when buying! This meant communicating with the producers to find out the origin of many of the ingredients. This lead to many product lines being withdrawn from our shelves if brands were found to not have RSPO certification. Why did palm oil become so prevalent and insidious in our lives? Palm oil can be hidden in many forms, anything from shampoo to flapjack, chocolate or margarine! Many of the derivatives are used as foaming agents or as hard fats often to replace animal fats. About 60% of the palm oil consumed globally is in the form of derivatives. Over the years people became increasingly concerned that hydrogenated fats were not good for us, unhealthy trans-fats that cause a host of health problems. So producers turned to an alternative; Palm oil, it is solid at room temperature and cheap to produce, which makes it perfect for replacing the use of animal fats and can be refined to have other properties. Infinity Foods will continue to pave the way, you can trust all the products in our shop to have sustainable palm oil. We now favor products free from palm oil which we are now seeing far more coming on the market. The range of palm oil free products in the store just keeps growing and growing! We proudly work with palm oil free makeup brands PHB ethical beauty and BOHO and other brands Living Naturally and Heavenly Organics all of which are palm oil free companies many of which are also plastic free. Obviously, many of our products are naturally Palm oil free, and you can easily avoid palm oil in your diet by leading a whole food lifestyle, you won’t find palm oil in fruit or vegetables or any of our organic freshly baked loaves of sourdough bread. When it comes to processed foods or lotions and potions that’s when it becomes more difficult in avoiding Palm oil and its derivatives. You can trust Infinity Foods to do its research for you! 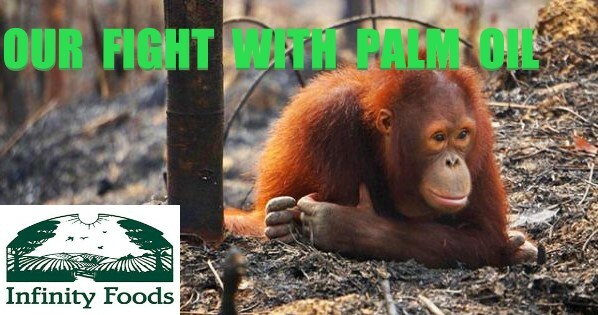 Ask the staff for any more advise on shopping to avoid palm oil. Moving away from palm oil means we can start to live with nature, protecting the rainforests and all of the wildlife who live there!